Newly designed free blowing beginners Tenor Sax with good construction, intonation and solid sound, ideal for beginners, comes with a Windcraft student mouthpiece. 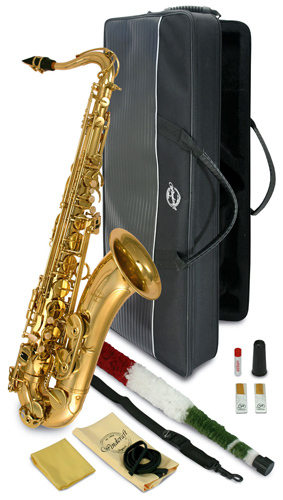 Supplied in a lightweight fabric style case, complete with reeds and accessories. The internal bore designs, keywork layout and tuning scale have all been designed with the student in mind. This attention to detail is intended to give the beginner the best chance of progressing through the first few grades. Proven by years of workshop knowledge and acoustic techniques these design features bring genuine benefits to the starter player. Bought a tenor sax - really good second hand instrument - thanks a lot !